Michial Farmer , 19 July 2016. MacQuarrie calls the third section of his book “Applied Theology,” but it would perhaps better be called “applied faith,” since, as he admits, much of the worldly outworking of theology is not itself theological. That being said, we need to reflect on our ecclesiology and related matters lest they become stagnant and deceptive–and the nature of that reflection will be theological. MacQuarrie reminds me quite a bit of James K.A. Smith and his co-writers over at Comment magazine here. That magazine (which is more than worth your $30 a year) is built on the premise that institutions are not just necessary evils but positive goods. MacQuarrie agrees that we need to embrace the church as an institutional structure that is the only thing that allows embodied beings like us to live out our faith in this world. We must remember, however, that the hipster evangelical has a point and that institutions can become stagnant and suffocating rather than life-giving. The Church exists both on the global level and in many internal divisions. So on the one hand, when we refer to the Church, we’re talking about the entire body of Christ over the centuries–but we’re also talking about individual denominations and groups within that body. An ecclesiology must take stock of the entire structure of the Church and of these smaller organizations, each of which will have its own ecclesiology within the larger schema. Some groups (such as the Roman Catholic Church) emphasize the role of tradition over that of Scripture; others (like most Protestant denominations) emphasize the role of Scripture over that of tradition. Neither of these groups entirely discards the other criterion, however, and nor do they discard the role of reason, which is emphasized by liberal Protestants. 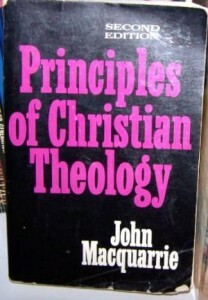 MacQuarrie suggests that we need a system of checks and balances among Scripture, tradition, and reason. The exact balance will look different from one group to the next, but every Christian group must pay close attention to all three criteria. Another balance comes in our disciplinary approach to ecclesiology. It would be very foolish indeed to look at it only as a collection of sociological, or psychological, or aesthetic artifacts–but it would be also foolish to ignore these dimensions of ecclesiology. Thus theology is a separate discipline from the others, but it’s connected to them, and our understanding of the Church and its structure and function must take all these disciplines into account if it is to be adequate. I believe there are some denominations that practice the checks and balances better than others; but, within all denominations there will be thinkers and writers who rise above and do it better than their own particular group. Thomas Merton was a more modern example of this. His book, Conjectures of a Guilty Bystander, is a wonderful treasure of one who spent his entire spiritual life embracing and wrestling with all three with as much honesty as we could ever expect from a human being.